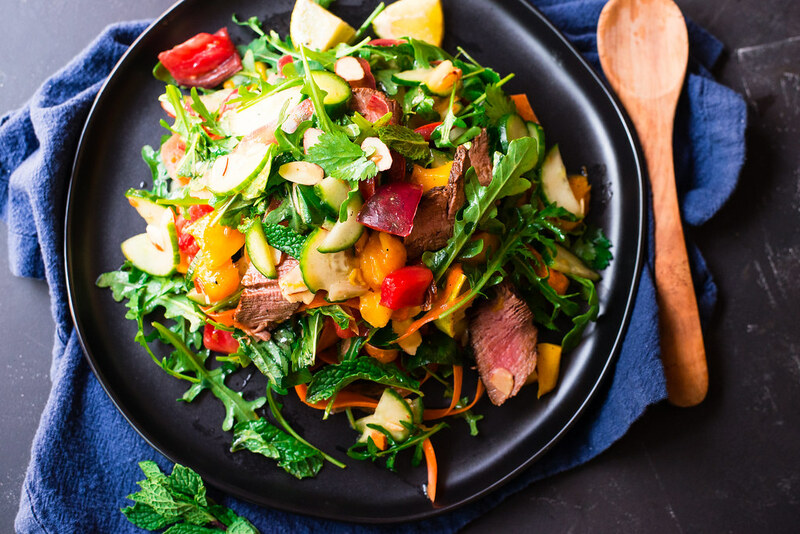 Thai Steak Salad Full of Layers of Flavor and Tossed with a Sweet and Sour Chile Vinaigrette, Fresh Mango and Bright Herbs, Such as Basil and Mint. I don’t eat steak often, but when I do, it will be for this insanely layered sweet, savory, slightly sour Thai steak salad. This gorgeous salad is prized for it’s intense range of colors, coming from all the fresh ingredients, such as fresh mango, basil and mint. I was telling a girlfriend about some of the salads you’ll find in my cookbook and ones I make often. 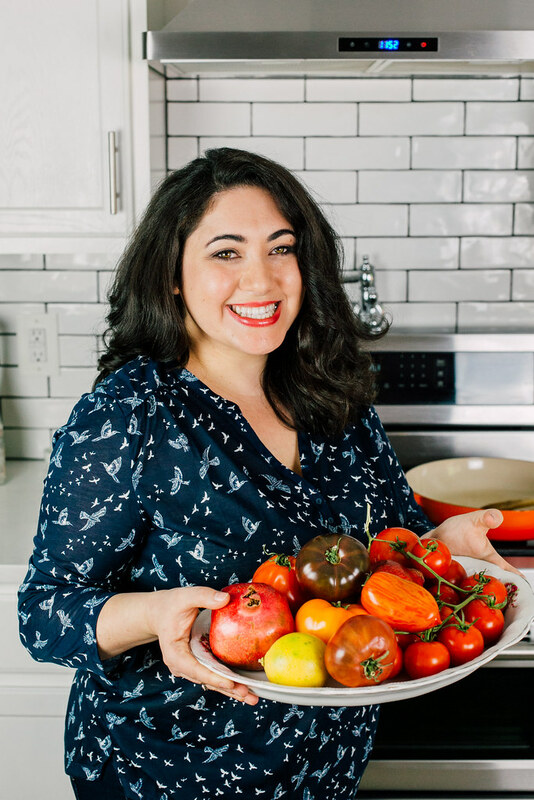 Mediterranean fattoush salad is one of my favorites as I love to add fresh herbs, such as parley and mint. It helps bulk on your salads and gives an added layer of contrast and freshness that sometimes typical lettuce leaves just can’t offer. 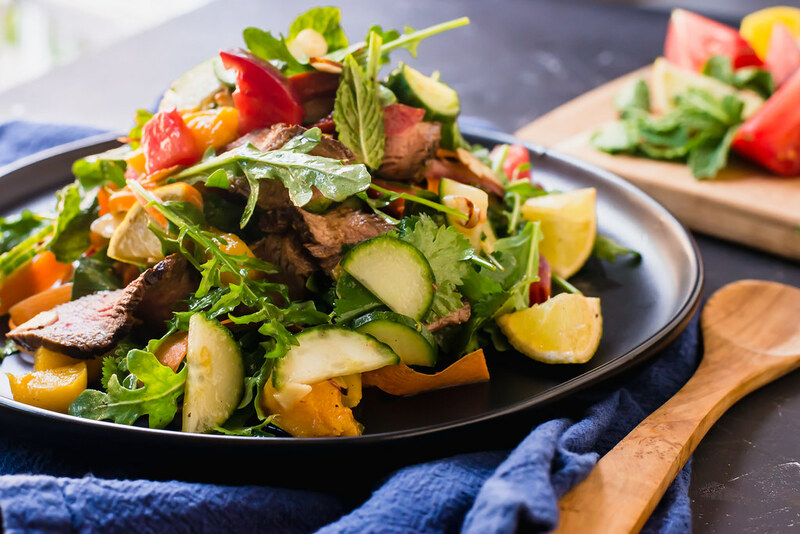 This Thai steak salad is no exception and summer is the perfect time to load up your salads with fresh herbs, such as loads of mint leaves, fresh basil, cilantro and parley, which pairs perfectly in this Thai beef salad. I just can’t get over the vibrancy of this beautiful Thai steak salad. Not only beautiful to look at, but flavors of sweet from the fresh mango, bright from the basil and mint and savory from the seared steak is just a lovely combination. Next time I think I will toss a small handful of cooked rice noodles to expand this Thai steak salad even more. Grape seed or canola oil for cooking. Begin by whisking together the steak marinade ingredients in a bowl and add steak to marinade. Turn over to coat on all sides and set aside as you prep other ingredients. You can also make this earlier in the day and place in the refrigerator. Heat a grill pan to high heat and drizzle with grape seed oil (You can also grill the steak on an outdoor grill.) Use tongs to remove steak from marinade allowing any excess sauce to drip off. Cook steak on hot grill for about 4-5 minutes on each side, until there is a good seared char and it’s medium-rare to medium in the center (or desired preference). Once done, remove from grill and set aside to rest. In another bowl, add all the sweet chile vinaigrette ingredients together minus the grape seed oil and stir together. Then slowly whisk the grape seed oil, making the vinaigrette. Taste for seasoning and adjust as necessary. 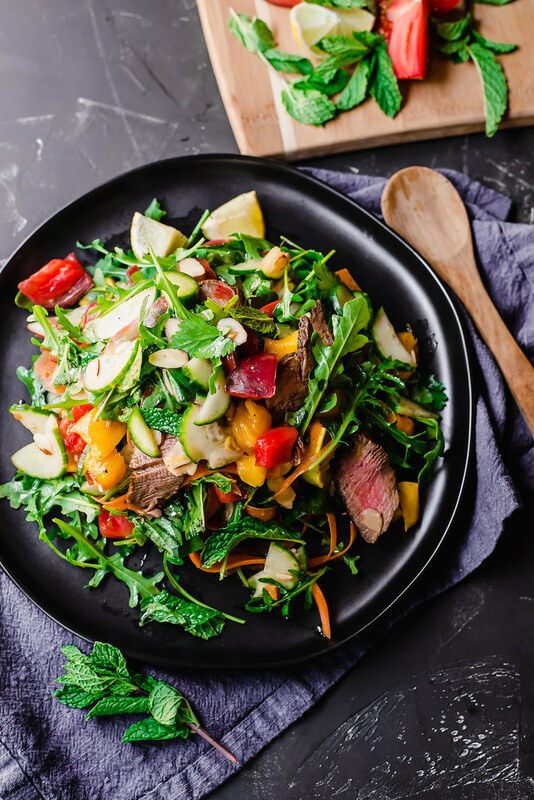 To assemble the salad, add the cubed mango, arugula, sliced cucumber, tomatoes, peeled carrot, fresh herbs and toasted almonds together in a large bowl. Slice steak into ½ in slices across the grain and add to salad. Pour dressing over salad and toss everything together so vinaigrette is evenly coated. Divide salad between 2-3 bowls and serve with lime wedges. This sounds great! I love adding mint to salads. My secret ingredient.